And so we come to the endeavour road. The wise goose has been cooked. Pressure may indeed make gems, but if you’re out of your depth it’ll give you the bends. The room for improvement at Bramall Lane has never been bigger, and it’s time for someone new to rearrange the furniture. I had thought I was on the fence about whether or not Sheffield United should retain Nigel Adkins’ services after the worst season I’ve ever had the misfortune to witness at Bramall Lane. After all, it wasn’t all his fault - what manager wouldn’t struggle to breathe life into the bloated squad of complacent serial crocks left behind by Nigel Clough? And back when he was appointed last summer I, like most United fans, thought he was absolutely the right man for the job. 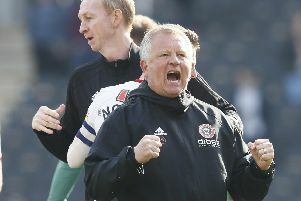 He was overwhelmingly the fans’ choice of manager, and most agreed that he would need time and patience to get a long-term promotion plan in place. We can’t keep on sacking managers every year, we all said, and part of me still believes that. But when it came down to it my reaction to Adkins’ departure was to punch the air and cheer - something I’ve had scant occasion to do watching United since he took over the managerial reins. At first his positive attitude and penchant for quoting ancient Chinese tactician Sun-Tzu seemed a breath of fresh air after the dour and surly Clough. But as the season progressed the sixth-form philosophy began to irritate, more Gordon Brittas than Arsene Wenger. Post-match interviews offered nothing of substance or value apart from the chance for fans to play Adkins Bingo with his favourite empty management consultancy phrases: “hard-working group of professionals”, “oohs and aahs”, “worked hard on the training ground” and of course “endeavour”. Endeavour. It’s just a fancy word for “try”, and precious few of the players have been doing that this season. So, I’m not exactly gutted to see the back of him. He took our club backwards, so we need someone else going forward - full house! - and better to get shot swiftly rather than repeat last season’s mistakes by waiting until after the retained list is finalised. Especially when so many out-of-contract failures can be swept into the gutter by a new broom.